"It looks like your collection is incomplete. In some cases you're missing the 'D', with other states it's the 'P' coin you don't have. I guess you'll have to keep on scanning through your change to collect them all." As bad news goes, my discovery was benign as benign can be. I'd merely found that the collection Aunt Kathy believed to be a complete set was actually lacking certain coins she was certain she'd previously acquired. For over a decade Aunt Kathy had sifted through coins coming back to her as change. She'd thought she'd collected two of each of the commemorative quarter dollars (one from the Denver mint, the other from the Philadelphia mint) representing each of the 50 states. It was only when I plugged each coin into its corresponding slot in special cardboard collector sleeves that had also been lying in her closet for years that we discovered the discrepancy. 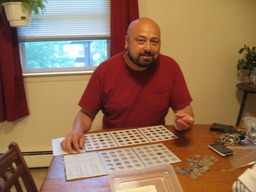 How did I wind up organizing Aunt Kathy's coin collection? Whenever I play houseguest it feels like a simple courtesy to offer help beyond the basic chores such as washing dishes and tidying up over my visit. And whenever I pass through Chicago there are indeed always several projects I can help out with when calling at Aunt Kathy's condo. Inevitably--as with the U.S. state quarters--the process begins by pulling some box out from her closet to finally take on the long-neglected task. 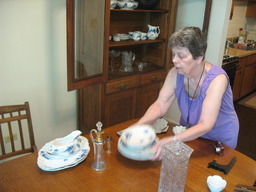 Though she sometimes does need help moving a heavy item of furniture or has computer-related questions she couldn't figure out herself, Aunt Kathy doesn't always ask for help with projects she couldn't accomplish on her own. Often it's more a matter of sitting down , focusing, and finally crossing off an action item with deliverable date of "someday" that has been on the to-do list for well too many years. In addition to pulling the unsorted coin collection out of the storage closet, Aunt Kathy also dredged up a brand-new shower head in unopened packaging. Could I help replace the existing one? I'd done little plumbing repairs and had never swapped out a shower head before but found that it was pretty simple, not much more complicated than twisting the old one off and screwing the new one on. Ironically, Aunt Kathy had actually made this type of repair before herself in the past. But, she'd deliberately put off doing the job on her own this time as she would need to pull out a stepladder to climb up on top of. It was easier to just wait for me to come to town. I could stand up on my toes and reach the pipe sans-stepladder. Another request: photographing and cataloging items that might potentially be heirlooms for my nieces and nephews back in Seattle. These included articles of furniture crafted by either my grandfather or my great-grandfather and a 19th-century china collection acquired by my grandmother. But, how we spent our time over this visit was less tackling neglected tasks and more just hanging out and catching up. Action at her condo chiefly involves observing her grey tabby, Mollie, while we watch whatever TV series Aunt Kathy is currently following. 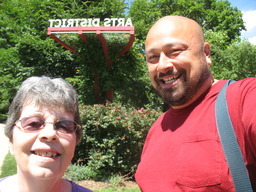 On occasion, we did manage to venture out around her Oak Park neighborhood: We tracked down a tree that had been planted in her honor when she retired from the neighborhood elementary school. We found the local deli still serves up yummy chocolate phosphates.